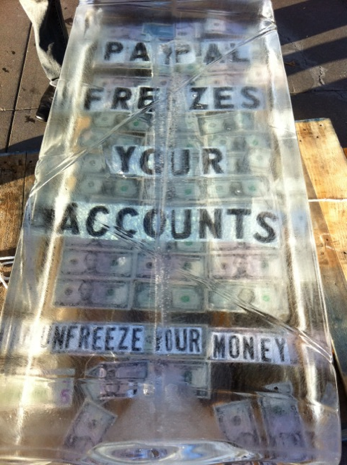 If you’re headed to PayPal’s big developer conference in San Francisco today, you may spot an unusual landmark sitting in front of the Moscone Center: a massive, 600 pound block of ice with hundreds of dollars locked beneath the surface. 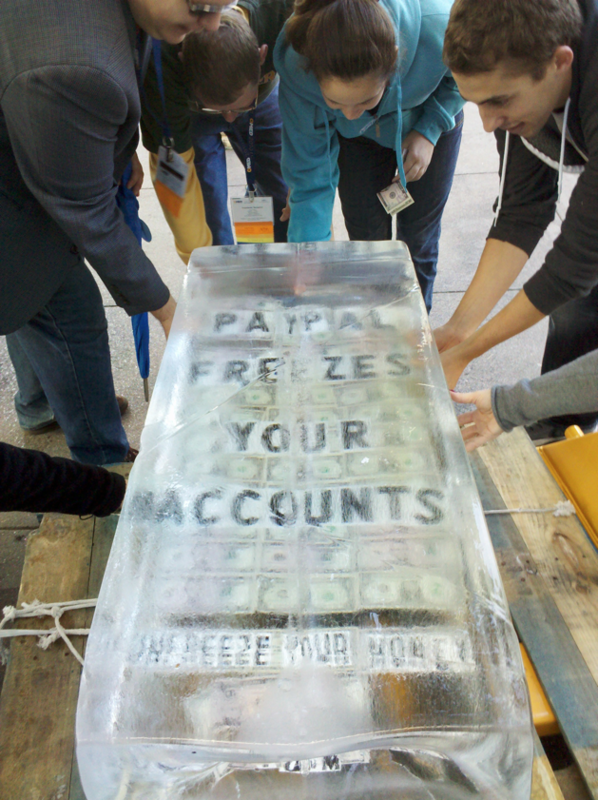 The frigid booty comes compliments of the WePay team, and they’re trolling PayPal’s conference in an effort to tell everyone in attendance that “PayPal freezes your accounts” and that you should “unfreeze your money”… by switching to WePay, of course. Update: WePay has put together a blog post explaining how they pulled this off. It’s still early in the day, but the block of ice has already led to quite a bit of drama, including a moderate-speed chase involving a pallet mover. According to WePay cofounder Rich Aberman, the WePay squad wheeled the ice block over to the Moscone Center on a pallet mover and dropped off the cargo without issue. Aberman then quickly dashed away with the mover in tow, which he planned to hide nearby (Moscone security wouldn’t be able to remove the ice block without it). Aberman made it 2.5 blocks before being chased down by a member of the Moscone security team, who proceeded to grab the pallet mover and wheel it back to the block of ice. After getting the ice back onto the mover, he wheeled it off Moscone property. Now Aberman tells me that the WePay team has resorted to wheeling the ice in a circle around the block. WePay competes with PayPal on the group payments front. The service makes it easy to accept payments from multiple people, which makes it well-suited for everything from event ticketing to splitting your monthly bills with your roommate (without all the lame IOUs). In some ways, PayPal has this coming — and not just because of its account freeze issues. Back in its earlier days when it was still sparring with eBay, a group of PayPal employees headed to southern California for a major eBay event. The PayPal team then proceeded to offer conference attendees a chance at winning hundreds of dollars — but only if they wore special PayPal-branded T-shirts to the conference the next day. Many of them did, and eBay got to watch its conference get taken over by a competitor. Of course, eBay then went on to acquire PayPal.